I chopped up the onion and sweat it out a bit in my new large pan with a lid (the husband found me this great pan at TJ Maxx for $15 since my old pan was on it’s last leg). 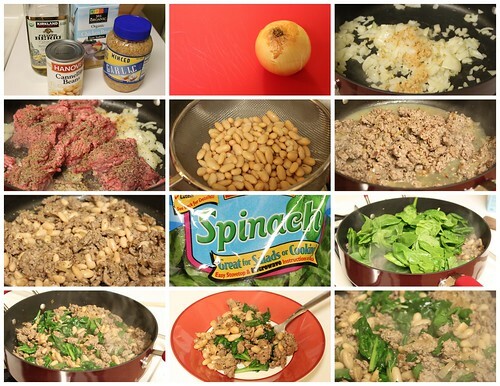 I added a lot of garlic to the onions and then tossed in my ground turkey. I seasoned it heavily with poultry seasoning (because everyone always has a ton in their pantry and never uses it) and salt and pepper. I let that brown nicely. Once the turkey browned up I added the chicken stock to get all the bits up and let that cook down a bit. 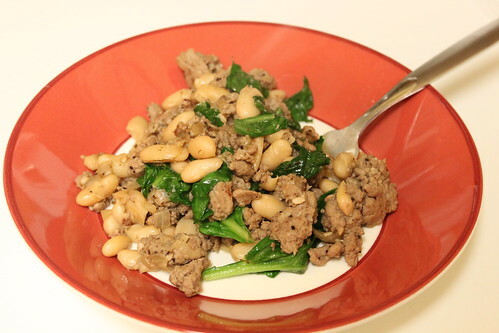 Then I tossed in a rinsed can of beans and then put in about half a bag of fresh spinach on top. I let that wilt down but not too much – I didn’t want to zap all the nutrients out. And that’s it! It was a quick mash-up of flavors that I love but it was so tasty and quick. I’ll definitely be making this one again. I need some more one pot wonders to add to my list of quick dishes. Yum!